Treve's trainer has insisted that last year's Prix de l'Arc de Triomphe winner should not be ruled out of the defence of her crown next month. 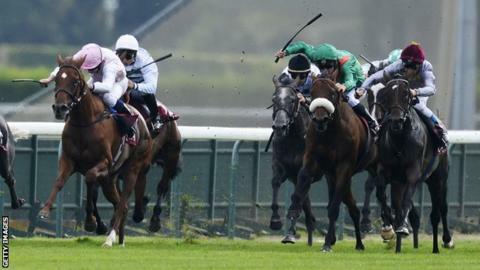 The filly suffered her third successive defeat in the Prix Vermeille at Longchamp in Paris on Sunday, finishing fourth behind winner Baltic Baroness. But Criquette Head-Maarek said: "I will do everything I can so she can be at the start of the Arc." Treve's defeat was her first in five races with Thierry Jarnet on board. The Frenchman replaced Frankie Dettori at Head-Maarek's request last week, but could not turn around the four-year-old's recent fortunes. Head-Maarek admitted: "The filly had a few problems and it might be that she is not the same filly as she was last year. "The decision [on whether to run her in the Arc] shouldn't be made hastily." Baltic Baroness, ridden by Maxime Guyon, claimed a narrow victory in the one-and-a-half-mile race ahead of William Buick's mount Pomology.